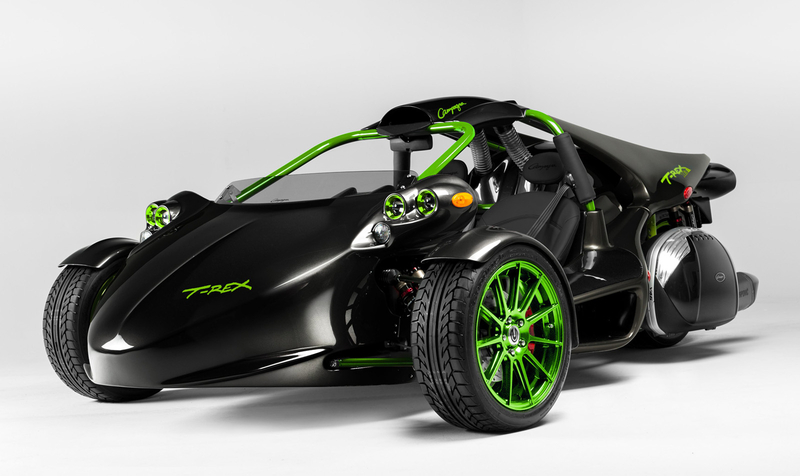 Campagna Motors announced that it will unveil a 100 percent electric version of its T-Rex three-wheeler using a powertrain from Zero Motorcycles. Even though this is just a prototype, it’s still pretty exciting. Zero Motorcycles, arguably the leader in the electric vehicle market, has been expanding lately by working with other companies to adapt their powertrain technology to other vehicles. Their powertrain features a clutchless direct drive design as well as an onboard charger. The company’s most recent design boasts a 14.4-kilowatt-hour battery, which for a motorcycle can deliver a range well over 200 miles. The Campagna T-Rex has been in production for about 30 years now. And it’s undergone a number of engine transplants along the way. For its gasoline-powered models, Campagna turned to companies like BMW and Harley-Davidson for powertrains. Campagna said it picked Zero as its partner for the electric T-Rex because of the company’s reliable and energy dense lithium-ion batteries. We’re excited that Campagna selected our industry-leading powertrain technology to develop their electric T-REX. Zero’s electric powertrain is an ideal solution for the ultimate three-wheeled experience. This vehicle is an absolute thrill to drive.